The additional 60 feet of clearance has contributed to 107 Panamax cargo vessels — large ships that can carry up to 14,500 20-foot-equivalent units or TEUs — to access the port’s terminals. It is also helping to increase traffic at other East Coast facilities, the port authority said. Port officials said the combination of the additional capacity and strong U.S. economy is contributing to exceptional business growth. Filled import containers with commodities are up more than 10% in the first quarter, compared to the increase of 7.2% for the same items at other facilities. Officials also said the six facilities they operate in New York and New Jersey combined set a new monthly cargo volume record every month for the past nine consecutive months. Furniture, heavy machinery, beverages such as beer, wine and spirits, plastic products and apparel and clothing are the most frequently imported items, it said. By raising the Bayonne Bridge, the port authority increased competition among ports from Boston to Miami, he added. “The port business is extremely competitive so I think ports up and down the East Coast are doing what they need to do to be competitive with other ports,” Coleman said. In fact, port officials at other facilities said the bridge-raising project is helping business at their terminals. In some cases, once a large cargo ship makes its initial stop at New York and New Jersey, it then heads south to Baltimore, Norfolk, Va., Charleston, S.C., and Savannah, Ga., to make more deliveries. “Clearly the ships are getting larger and often they are making multiple drops. The ports are keeping up, by dredging their channels and building more infrastructure to handle the traffic once the cargo is offloaded on trucks or rail,” John Young, director of Freight and Surface Transportation Policy at the American Association of Port Authorities, told Transport Topics. A recent AAPA report said more than $20 billion will be needed to fund improvements in multimodal and rail access for America’s ports to remain efficient and competitive during the next decade. This is on top of the $155 billion the ports and private sector already plan to invest during the next five years to expand terminals and make needed infrastructure improvements. 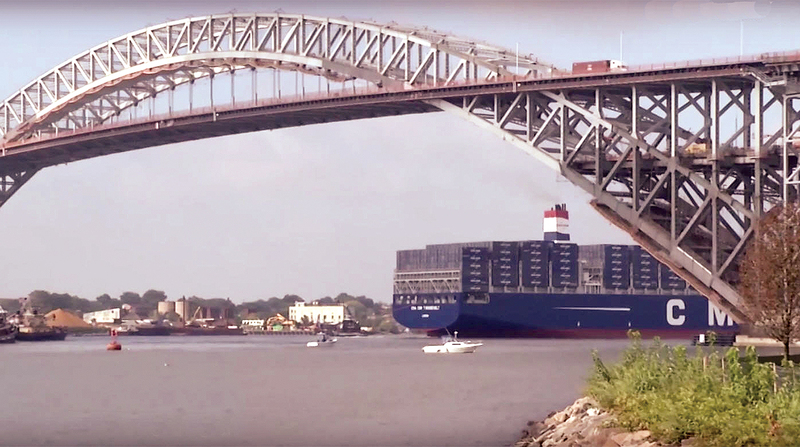 The Port of Virginia said the raising of the Bayonne Bridge has resulted in a significant increase in its weekly number of total ships, as well as more calls from New Panamax vessels. To keep pace, the Port of Virginia is planning by 2024 to deepen its channel to 55 feet from 50 feet, and widen it to 1,400 feet. These improvements, the port said, will make it the largest and deepest port on the East Coast, expanding its capacity by 40%. The channel was last deepened 15 years ago. The Virginia Legislature has sent to Gov. Ralph Northam a spending bill that includes $350 million for the project. Currently, when the large cargo vessels (up to 14,000 TEUs) arrive, the U.S. Coast Guard must temporarily close Norfolk’s shipping channels, causing delays, as the channels are not deep enough to accommodate two-way traffic. Officials said the deeper channel will not only expand capacity, but it will end the delays for smaller cargo ships and other vessels.